Are social media making society more creative – or less? COMM 3307 – to complete the assignment, read this, give the links a glance, and comment either below or on the Facebook group – before Monday’s class (2/23). 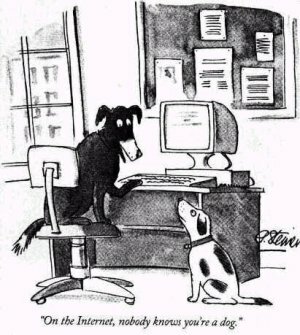 In 1993, New Yorker cartoonist Peter Steiner wrote his famous caption to two dogs at a computer desk: “On the Internet, nobody knows you’re a dog.” Twenty-two years ago, the idea was revolutionary. Anonymity was a lot harder to come by in the pre-Internet world. So was a soapbox. Today, digital and social media have leveled the playing field of many creative endeavors. Everyone – anyone – can be a writer, an artist, a pundit. Jerome Jarre was a homeless college dropout and multi-failed young entrepreneur who made himself into probably the best-known face on Vine. He’s parlayed his celebrity into a lead role at an ad agency owned by Gary Vaynerchuk and now a Snapchat channel in Robert DeNiro’s office space. Vaynerchuk knows the model well. Over the last decade, he used a quirky, no-budget vlog comparing wines to dirt and gummi bears to changed himself from a first-generation immigrant running his family’s liquor store into a conglomerate. He is now a bestselling author and motivational speaker with an A-list social media agency and an investment fund, as well as the original wine business, now exponentially larger. Age doesn’t matter when it comes to social media celebrity, either. Kids not even school-age are becoming popular comedians, singers, fashion designers, motivational speakers, and authors – and the biggest media corporations are taking notice. Social media is truly an equalizer: a landscape of equal-opportunity platforms where anyone can become a star. Bloggers, vloggers, Tweeters, Viners, Instagrammers. If you have an Internet connection, a laptop or a phone, and a handle on the zeitgeist, you, too, can go viral. But many argue that this freedom comes at a price – the price of originality. As just one example, I was quite proud of this title – “the democratization of creativity” – until it occurred to me to Google it, at which point I found it had been used two years ago. Oops. So, in a world where everyone can publish, and new information daily outpaces decades or centuries of the pre-digital world, is anything left unpublished? And how much of what is published is worth publishing? Do our Tumblr reblogs, Twitter retweets, and Pinterest pins do anything besides show our willingness to be sheep and/or parrots helping to spread the work of others (often, brands)? So what is it, really, that social media are helping to create? Things are changing, certainly. But to what end? Is it the democratization of creativity? Or is it something less easily defined and perhaps more pernicious? Less joyful and more capitalist? “The death of the ‘artist’ and the birth of the ‘creative entrepreneur’”?